Donations made by the NASC to two deserving charities at its 2018 Ball & Awards evening have been tripled – thanks largely to the generosity of members. NASC President and TRAD Group CEO Des Moore presented the Lighthouse Construction Industry Charity and Demelza Hospice Care for Children with cheques for £10,000 each as part of the black tie event held at the Sheraton Grand Hotel & Spa, Edinburgh, last month. He then urged members to help raise a further £5,000 for each charity through a five-lot charity auction. This fundraising goal was surpassed several times over during the course of dinner, with guests digging deep with their bids, helping to push the total raised well past each lot’s reserve prices. These efforts were supported by a number of members’ substantial standalone donations, who approached either Des Moore or the Ball toastmaster to submit financial pledges. Combined with the original £10,000 sum – and boosted by a £2,300 donation by CISRS – the NASC was delighted to reach a total fundraising figure of £60,000, which was split equally between each charity. The NASC presented each charity with their cheques earlier this month. Bill Hill, CEO of the Lighthouse Construction Industry Charity, said: “We are absolutely delighted to have received this huge donation from the NASC members. We urgently need funding to sustain our helpline services and develop our Building Mental Health programme and this money will go a long way towards making a difference to our construction families in crisis. Robin James, NASC Managing Director, said: “The money raised for these charities, predominantly from NASC members, will be one of the enduring memories of the 2018 Ball & Awards. The way members embraced the opportunity to support these two deserving charities both at the event and in the following days was great to see. A training facility run in partnership by Safety and Access and Knowledge Gird in Oman has passed its first CISRS Overseas Scaffolder Training Scheme (OSTS) annual audit. A steady stream of Scaffolders, Inspectors and Supervisors have successfully completed OSTS programmes at the purpose-built centre since it opened in January this year. Courses have taken place every month this year – undertaken by close to 200 operatives in total – and a number of courses set for 2019 are already fully booked. The bulk of the training delivered to date has been Level 1 Scaffolder plus Basic Inspection and Scaffolding Supervisors courses, however the centre in now running Level 2 Scaffolder courses and is hoping to increase its CISRS OSTS delivery to include Level 3, CPD and Systems training in Cuplok. CISRS Scheme Manager Dave Mosley, who carried out the audit, said: “Safety and Access and Knowledge Grid have done a great job with the facility here as only 18 months ago this building was an empty shell. The newly refurbished practical area, classrooms, canteen and welfare facilities provide an excellent environment for training. The NASC and CISRS were represented at a major, two-day scaffolding conference in China. The Construction Material Rental Contractor Association (CMRA) event, held in Tianjin, drew more than 600 delegates from across the country. David Mosley, NASC Director and CISRS Scheme Manager, was invited to attend as a keynote speaker. He gave a presentation on the role of the NASC in establishing best practice and producing guidance not only for its members but the industry as a whole. He also gave an overview of the UK CISRS scheme and CISRS Overseas Scaffolder Training Scheme (OSTS) and explained how having a regulated industry and a recognised training scheme had made the UK scaffolding sector a much safer place. After the presentation, David took part in a panel discussion aimed at exploring what advice the UK representatives could give to help improve the scaffolding sector in China. Andy Sharp, Senior Scaffold Instructor at Simian Skill, gave an interactive, hands-on tool box talk on SG4:15 Preventing Falls in Scaffolding Operations. The pair also gave an additional presentation to more than 60 health and safety representatives from the China State Construction Engineering Corporation, one of the largest construction companies in the world. Delegates said they were impressed with CISRS OSTS would be looking to send some of their workforce on Inspection and Supervisory Training courses. Howard Liu, Chief Director of WenMA formwork and Shoring, added: “Our members were really pleased that David Mosley and Andy Sharp could attend the annual conference. The NASC has published a suite of scaffolding product purchasing guidelines – simple, go-to documents for contractors to use so they can ensure the equipment they source is up to standard. Hard copies will soon be available for purchase from the NASC online shop here. They are available for free download now via the same link. Each PG note details purchasing best practice and outlines the standards to which customers should check that products they are sourcing are manufactured and tested to. This includes what to look for, what relevant information they should request and what a test certificate looks like. The PG notes are intended to be used in tandem with the NASC’s Code of Practice (CoP) compliant product list, which corresponds with the six PG product categories. All products on this list have been subjected to UKAS accredited independent laboratory testing over and above the testing and third-party approval standards of the manufacturer and supplier. The CoP compliant product list can be downloaded here. Robin James, NASC Managing Director, said: “Currently, as matters stand, there is no authority or organisation in the UK that licences or approves scaffolding and access equipment. And although, for example, system scaffolding, couplers and scaffold tube do have their own set of BS EN standards to which they should be manufactured, there is no independent UK third party approval scheme in place to audit or verify against and check that such products are being correctly manufactured and comply with these standards. “Clearly this is not an ideal situation in an industry that operates at height. It is in everyone’s interests that the products we purchase and use daily fall under some form of independent external scrutiny and third-party minimum standards. The NASC CoP compliant product list will be expanded as required. PST units are due to be added in January 2019. A corresponding PG note will follow shortly after. Since notification that West Anglian Training Association went into administration last month, CISRS has received may queries from those who had registered with them for their NVQ qualifications. People who are in possession of VQ portfolios issued by WATA will need to re-register with another provider for them to take over the qualification. They will need to contact an alternative centre directly. A list of training centres can be found here. For those who have submitted portfolios to WATA, CISRS has managed to retrieve some candidates’ portfolios from the WATA offices. If you have submitted a VQ portfolio and not had this signed off, CISRS may have your portfolio. If you are in this position, please can you email Laura Weekes and if we have it, we can return it to you. Candidates will need to re-register the VQ with another centre. NOCN have kindly offered to waive the re-registration fee for candidates in this position and CISRS thanks them for this gesture. Any enquiries about payments made to WATA can be made through the Administrators Mctear, Williams and Wood. They can be contacted by calling 0800 331 7417. Their website is here. 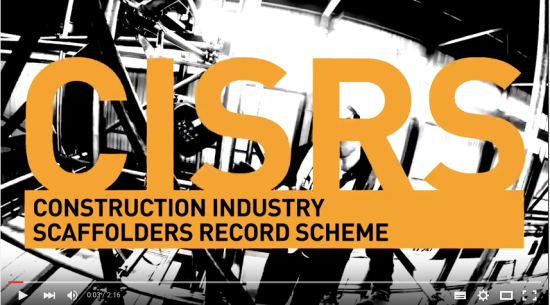 The latest scaffolder training news and updates were shared and discussed at the annual CISRS Instructor Conference. More than 40 delegates based at CISRS centres across the UK attended the one-day event, held at NCC’s training facility in Bircham Newton, Norfolk. The conference was chaired by David Mosley, CISRS Scheme Manager, who gave a presentation covering updates to Pt1, Pt2 and Advanced courses, CPD and systems scaffolding. Tony Barry of NCC Midlands and Access and Scaffolding Industry Training Organisation (ASITO) committee member also delivered an update on Trailblazer, the standard, end point assessment and external qualification assessment. Martin Coyd of Mace Group and Rev. Kevin Fear from CITB co-presented a session on Building Mental Health which included a tool box talk that can now be delivered by the instructors. Martin, Operations Director – Health, Safety & Wellbeing, said: “Kevin and I were grateful for the opportunity to speak at the conference and given the platform to discuss the current mental health crisis and how the whole industry can work together with the Building Mental Health Framework to bring about change. The conference also featured a breakout session where delegates provided their view on a range of topics including CISRS instructor qualification criteria, training centre capacity and training facility criteria. Thomas Winters, Director at All Access Training, said: “As a new CISRS provider, this was my first Instructor conference and I really enjoyed it. It was good to get a chance to meet up with other providers for a meal and a few drinks the night before. The NASC is proud to launch its 2019 Yearbook – showcasing the latest confederation news and updates. The Yearbook features a round-up of the achievements and plans of the various NASC committees, more than a dozen pages of project overviews submitted by NASC members as well as a comprehensive listing of full contracting NASC members. Robin James, NASC Managing Director, said: “We are delighted to launch the NASC 2019 Yearbook. I’d like to thank all those members that submitted copy for inclusion – showcased on the project pages – and also those that took advertising spaces. This year’s publication is packed with helpful information, reviews and updates on the work of the confederation, and includes reports from its standing committees including the new Current Affairs committee, which has already made a strong impression. “Whilst looking back at activities undertaken throughout this year, the Yearbook also looks ahead to 2019. We have plans to host more presentations and events up and down the country next year with a view to further increasing the number of clients including NASC membership as a pre-requisite for their projects. Des Moore, NASC President and CEO of TRAD Group, opens the Yearbook with his President’s Report, which takes stock of the successes of his first year in post and ahead to his ambitions for the year to come. He said: “I feel that we have put many wheels in motion during my first year as President and have generated a great deal of momentum. It’s now about keeping this going in my second year to ensure all successes are fully maximised and platforms put in place to deliver long- as well as short-term benefits. “Keeping this momentum going will require greater support and input from our membership and I encourage all members to get involved with NASC events and activities and to have their say on the future of the NASC. In addition to the 96 page printed version, an e-reader version of the NASC 2019 Yearbook is available to view here and via the NASC website ‘About’ page.